Project Global Underground reveals the complexities and universality in cultural diversity found inside mass-transportation systems around the world. The viewer travels through a virtual global underground while visiting the brightest and unique subway stations inside different countries and cities. In the era of globalization of the 21st century, with the unprecedented freedom of movement by individuals internationally, Project Global Underground expresses visual features of each underground system. The project joins and reflects shared cultural distinctions from around the world. In every country, the subway reflects extraordinary history as well as technological advances with cultural qualities that represent their individual period of construction. In addition, the specific character and ornamentation of subway stations, their urban background and development, and the inhabitants of each city, further characterize individual sites. Global Underground includes a number of artistic dimensions including video and digital forms of art, which visualize the transition from one global subway system to another. The virtual subway moves around the world with select stations from Moscow to New York, London, Paris, Berlin, Stockholm, Beijing, Hong Kong, Tokyo, Mexico and other major systems. (33 countries) Each site maintains its historical presence and quality along with universal traits that correlate all systems in an emerging global society. The development of a master catalog and other flyers, posters and related sources of information for magazines and newspapers, which document all aspects of the project, will be published along with mass media productions from co-sponsors. A permanent website is designed to include all sources of relevant material with continuous updates during the five-year project. 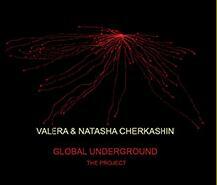 by the artists Valera & Natasha Cherkashin.